This is the ultimate question in the quest for finding the best tires for your bike. And it’s the most difficult to answer. There are so many variables, it makes it virtually impossible to provide an accurate answer. While we can’t measure every one of our tires on every wheel/frame/fork combo on the market, we did want to provide some standard measurements. 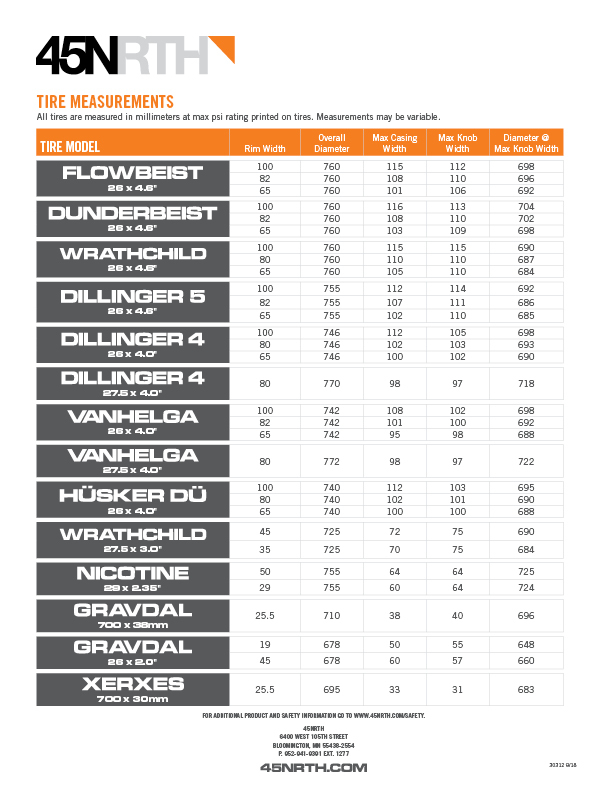 We measured the overall diameter, max casing width, max knob width, and diameter at max knob width of the Flowbeist, Dunderbeist, Dillinger 5, Dillinger 4, Vanhelga, and Hüsker Dü tires on 100mm, 82mm, and 65mm rims at 20psi. We also measured the Nicotine on 50mm and 29mm rims and the Gravdal and Xerxes on 25.5mm rims. We mounted our collection of tires and pumped them up - here are the results.